BEHIND a homely blue garage door in a genteel corner of Hammersmith sits Prudence, a complicated and expensive young lady, and the focal point of an ancient British industry that is undergoing a remarkable and timely revival. 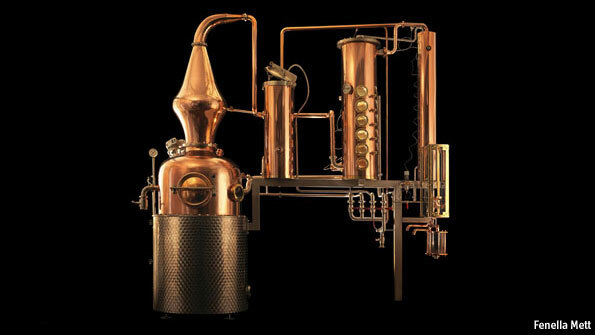 Prudence is a £200,000 copper still—the first of its kind to be launched in the capital for nearly 200 years—turning out small batches of exquisitely palatable London dry gin. Named after a certain former chancellor of the exchequer who gained an ultimately unwarranted reputation for fiscal austerity, Prudence is the brainchild of Sam Galsworthy and Fairfax Hall. They are the entrepreneurs behind one of Britain’s fastest-growing young micro-distilleries, Sipsmith.